New greener Peugeot 207 launched | What Car? Peugeot has launched a green 207 with carbon dioxide emissions of just 99g/km. The new 207 Economique is powered by Peugeot's 1.6-litre HDi diesel engine, which uses revised electronics and a modified five-speed manual gearbox with higher ratio gearing to help achieve an average of 74.3mpg. Other eco-friendly technology includes a gearshift indicator to help the driver select the most efficient gear, along with low-resistance tyres to further trim fuel consumption and CO2 emissions. The ride height has also been lowered by 5mm, to cut aerodynamic drag. The 207 Economique gets 15-inch alloys wheels, black instrument dials and grey interior door handles, along with chrome detailing on the gearknob. There are also side, passenger and driver airbags, plus three rear three-point seatbelts. It's available in two trim levels - Economique and Economique+ - with higher-spec Economique+ adding air-conditioning. However, the higher-spec model retains the same 99g/km co2 emissions through the use of Peugeot's energy-saving air-con system, which constantly monitors the external temperature and operates only when required. 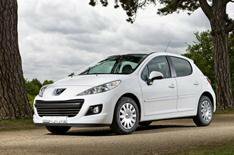 The Peugeot 207 Economique will go on sale in the UK in October, with prices from 12,995.